Talar body fractures usually occur as a result of high-energy trauma and variety of different type of talar fractures may occur. Most of the talar fractures are included in classification systems. Even though it is possible to observe talar fractures with concomitant dislocations, together by reason of their functional relationship with the tibiotalar, subtalar and talonavicular joints, such observations are only addressed in literature in the form of case studies. The present case, exhibiting talar body fracture in the coronal plane observed together with subtalar and talonavicular dislocations, is of importance due to the rarity of the diagnosis, treatment, and 2-year follow-up results. Talar fractures and fracture-dislocations are uncommon compared to other injuries to the ankle because of the location of the talus in the ankle joint and its anatomical structure. Talar fractures represent 0.32% of all fractures, 2% of lower-extremity fractures, and 5-7% of ankle fractures. However, the talus is the second most frequently fractured bone of all the tarsal bones[1, 2]. In the literature, the incidence of talar body fractures has been reported to be in the range of 7-38% of all talus fractures, and as 0.062% of all body fractures [3, 4]. The majority of these injuries occur as a result of high-energy trauma [5, 6]. The lack of muscle attached to the talus and that a large part of the surface is covered with articular cartilage create a predisposition to talus fractures and concurrently observed dislocations. The treatment of talar body fractures is rather problematic due to the complex anatomy and the diversity of fracture patterns [7, 8]. Treatment becomes even more difficult when these fractures are accompanied by dislocations of adjacent joints. The case presented in this paper emphasizes the importance of emergent open or closed reduction and stable fixation with lag screws and Kirschner wires. The concurrency of talar body fractures specifically with dislocations of adjacent joints has been addressed with only a few case studies in literature. This case study presents a subtalar and talonavicular joint dislocation of a talar body fracture in the coronal plane and is of paramount significance in that it was treated with open reduction and internal fixation and the clinical follow-up results of 2 years are available. A 32-year-old male was brought to our Emergency Department after sustaining a motorcycle accident with complaints of intense pain and deformity of the right ankle. On physical examination, the ankle was seen to be in an inverted position and there was distinctive deformity accompanied by local paleness arising from skin tightness on the lateral side (Figure 1). The neurovascular examination results were normal. The patient had no accompanying additional injuries. Direct radiographs of the ankle revealed a talar body fracture accompanied by subtalar and talonavicular dislocations (Figure 2). Under conscious sedation, closed reduction was attempted twice in the Emergency Room with no success. 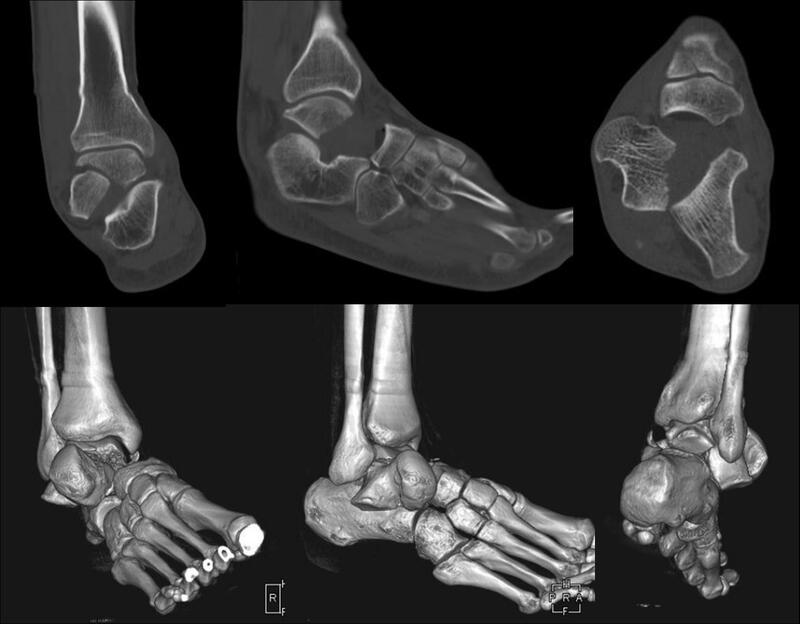 Computed Tomography (CT) was performed and demonstrated a coronal plane talar body fracture associated with subtalar and talonavicular dislocations. A distal fragment of the talus was dislocated, twisted and locked (Figure 3). Thereafter, open reduction and internal fixation of the fracture was planned. Figure 1 Clinical image of the case in ED. Figure 2 Pre-operative radiographic evaluation of the case. Figure 3 Pre-operative CT scan. Once the surgical preparations had been completed, the patient was taken to the operating room approximately 3 hours after the trauma. Under spinal anesthesia and tourniquet application, an anterolateral incision was used to expose the fracture. The talar head was observed to be locked in the form of a button and a hole in the anterior capsule. The capsule was retrieved from the talar head and reduction was secured. The talus was fixed with two cannulated screws. The subtalar and talonavicular joints were seen to be unstable, and could be dislocated with a weak inversion strain. Therefore, both the subtalar and talonavicular joints were fixed with K-wires (Figure 4). The achievement of anatomic reduction of both the fracture and the subtalar and talonavicular reduction was monitored postoperatively through a CT scan. The patient was discharged from the hospital with a short leg brace on the 2nd postoperative day. The sutures were removed on the 20th day and the K-wires were removed and active ankle exercises were started in the 6th week of follow-up. Full weight bearing was started in the 8th week following the observation of complete healing of the fracture. The final clinical and radiological follow-up was performed in the second postoperative year (Figure 5). The patient had already returned to work and social life and his AOFAS score was 87 with no significant finding of arthrosis or any other complaint. Figure 5 Post-operative CT examination of the case. Figure 6 Radiographic evaluation of the case 2 years postoperatively. Fractures of the Talus typically involve the tibiotalar joint. In their simplest clinical forms, they can be classified as fractures of the talar head, talar neck, talar body, and talar process. In the AO/OTA classification, however, talus fractures are defined as extra-articular fractures covering neck fractures and avulsion fractures, partial intra-articular fractures covering split or compression fractures, and intra-articular fractures divided into non-displaced, displaced and segmental fractures. The distinction between talar body and neck fractures is of great importance. A relevant evaluation defined body fracture as a case with the fracture line lying proximal to the lateral process of the talus and neck fracture as a case with the fracture line lying distal to the lateral process of the talus [9, 10]. Talar body fractures have various classifications. The generally utilized Sneppen classification divided these fractures into five main headings: Type I, osteochondral or transchondral; Type II, coronal, sagittal horizontal, non-segmental; Type III posterior tubercle; Type IV lateral process; and Type V, crush fractures . The Fortin classification defines talar body fractures under three headings: Type 1, talar body fracture on any plane; Type 2, talar process or tubercle fracture; or Type 3 compression or impaction fracture of the talar body . Apart from these headings, these fractures involving the talar dome can also be classified as sagittal, coronal, transverse or segmental fractures depending on the main fracture line. Certain types of fractures and fracture-dislocations not included in the aforementioned fracture classifications can at times be provided in the literature as case reports [13-18]. Identification and classification efforts are still ongoing for these fractures and accompanying dislocations . However, there are some authors who argue that these means of classification do not contribute to the selection of suitable treatment or treatment results [2, 8, 12, 20]. The current case was defined as a talar body fracture on the coronal plane accompanied by subtalar and talonavicular dislocations outside the scope of these classifications. Therefore, these types of fracture-dislocations can be indicated as a rare injury where the fracture type has been classified in literature without any dislocation type specified. The mechanism of injury in talar body fractures is generally defined as the exposure of the talar region to axial load or shear forces between the tibia and calcaneus . This frequently occurs in motorcycle accidents, as in the current case, or incidents of individuals falling from height. Moreover, these fractures may be accompanied by calcaneus, tibia and talar neck fractures since most of them are induced by high-energy injuries. The observation of dislocations and ligament injuries in various adjacent joints is not surprising with such a mechanism of injury. As an example, a case of medial total subtalar dislocation was reported without a fracture in the ankle . Similarly, another case was defined as a talar body fracture accompanied by anterior talofibular ligament and peroneal longus tendon injuries . 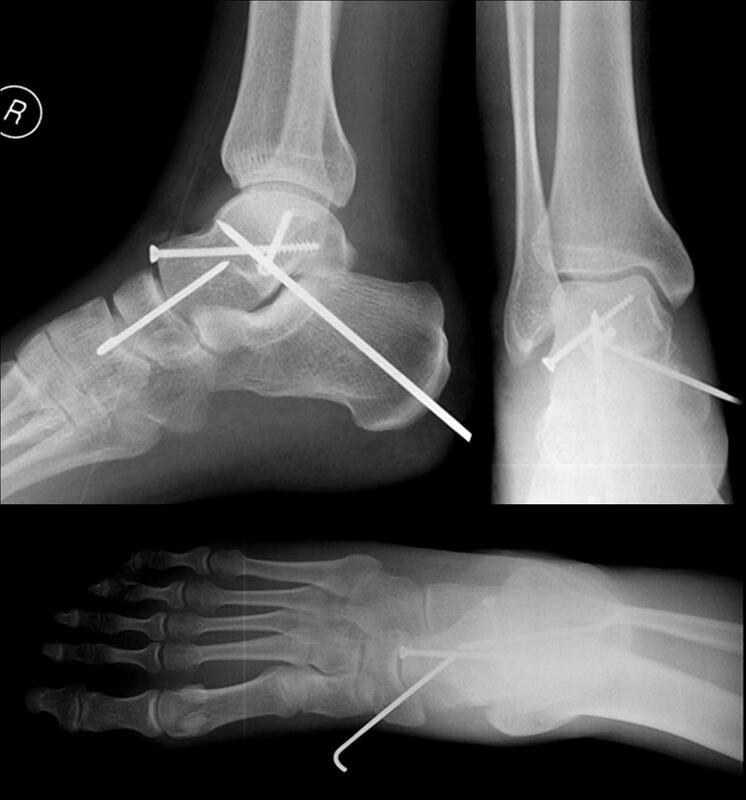 Although the literature does not include a high number of series pertaining to dislocations observed together with talar body fractures, a series of 23 talus fractures provided the finding of 7 peritalar dislocations . Adjacent joint fractures accompanying talar body fractures are addressed in the literature with only a few cases [13-18]. Talus fractures can be diagnosed through standard radiographies in general. However, adjacent joint dislocations clearly add difficulty to the diagnosis of such fractures. Hence, a good radiological evaluation from the beginning is of great value for prospective surgical planning. At this stage, CT is of extreme importance to undertake a complete evaluation of the structure of the fracture and to guide the course of treatment. At times, MRI might be required for the additional evaluation of soft tissue injuries in surrounding ligaments and tendons. Early emergency reduction should be performed for all fracture-dislocations of the talus with a view to preventing soft tissue damage and not to disrupt the circulation in the talus. Specifically displaced talar neck and body fractures should be treated with open reduction and stable internal fixation in the early stage. Closed or percutaneous reduction may be attempted immediately after sufficient analgesia and relaxation. However, repeated unsuccessful attempts at reduction may increase the damage in fracture-dislocations with already severe damage in soft tissues. However, open reduction is mandatory for locked dislocations, as in the present case or for dislocations with soft tissue in between which cannot be managed with close reduction. If a patient cannot be taken into open reduction for patient-related or other reasons such as in the case of polytrauma patients, the fracture should undergo initial reduction through minimally invasive methods to the extent possible and then be fixed with Kirschner wires . As is the case in other open fractures, open talus fractures require surgical intervention . Furthermore, if the foot is diagnosed with compartment syndrome, dorsomedial dermatofasciotomy should also be performed through upper and lower extensor retinacula. This approach will also allow for open reduction and fixation. Some cases may require medial malleolar osteotomy for anatomic reduction depending on the medial location and extension of the fracture. Patients with severe soft tissue damage and fracture-dislocations may have tibia-metatarsal external fixators applied and the necessary follow-up . In the present case, it was decided to perform immediate open surgical reduction due to failure in the initial closed reduction and reduction was obtained by retrieving the talar head from the point where it was interlocked like a button and a buttonhole in the capsule by employing an anterolateral incision which could facilitate reduction. Open reduction approaches which have been suggested for anatomic reduction includes posteromedial, medial and anteromedial approaches. Some authors have also reported the use of an anteromedial and anterolateral double incision . These approaches provide various advantages. As an example, a posterolateral incision is known to disrupt the blood flow to a lesser extent, but makes it difficult to position the patient and offers a limited approach. Whereas a medial incision provides a more convenient approach specifically together with medial malleolar osteotomy, as there are known problems associated with osteotomy, in addition to the risks to the regional anatomic structures. Similarly, an anterolateral incision also has its own specific advantages and disadvantages. In general, the type of fracture and the experience level of the surgeon are considered to be more important for the approach to be selected . Another important preference is the method of arthroscopic assisted internal fixation method, which has been defined in literature as a less invasive option specifically for the talar transchondral dome [21, 27]. Fixation with headless or bioabsorbable screws is recommended due to the anatomical structure of the talar bone and the articular nature of the major part of the surface. In the current case, fracture fixation was secured with cannulated screws. In cases where the fracture is accompanied by unstable joints and loss of reduction even after a small-scale strain, additional support may be provided to improve stability through the fixation of both subtalar and talonavicular joints with K-wires as in the current case. Consequently, talar body fractures involving distinct displacement pose a difficulty in treatment especially if they are accompanied by dislocation in an adjacent joint and long-term results are generally poor unless a good course of surgical treatment is followed. Talectomy is not always practical because of problems such as pain on weight-bearing and instability, and should only be considered for adults. In this case, better results could be obtained when calcaneotibial fusion and talectomy are implemented concurrently . Nevertheless, this should be included in the treatment as a final step. 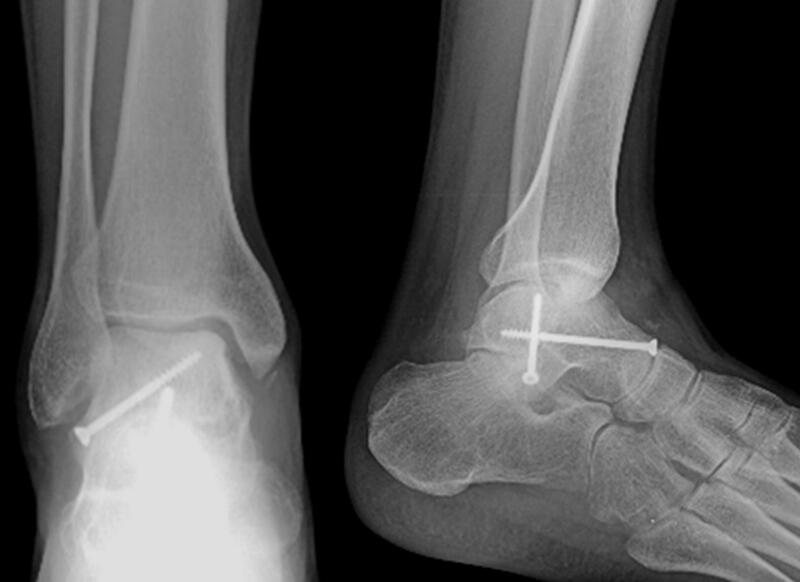 Surgical complications pertaining to talus fractures notably include avascular necrosis [AVN], post-traumatic osteoarthritis, non-union, malunion, and infection. In a study of 26 cases of talar body fractures, poorest results were reported based on 1-year follow-up radiographs with AVN in 38%, with post-traumatic tibiotalar osteoarthritis in 65%, with post-traumatic subtalar osteoarthritis in 34%, and with segmental and severely displaced fractures . Particularly after talar neck and body fractures, the AVN risk remains almost the same, while the risk of post-traumatic subtalar arthrosis is higher. Moreover, one study in literature reported the incidence of AVN for talar body fractures without dislocations to be 25% and the risk of AVN accompanying dislocation to be 50% . Another meta-analysis indicated these rates as 10% without dislocation and 25% with dislocation . The previously higher incidence of AVN has been reduced due to improved surgical approach methods that have been implemented in more recent literature [31, 32]. It has also been demonstrated that the waiting period for internal fixation does not create a significant effect in terms of the development of AVN in studies undertaken at various centres [32, 33]. Another study reported post-traumatic osteoarthritis at 50% in the ankle after compression fractures, at 41% after shear fractures and at 24% in the subtalar joint . The incidence of osteoarthritis in talar body fractures is closely associated with the type of fracture and injury. Consequently, it is as difficult to diagnose talar body fractures as it is to apply treatment and to follow up the results of treatment. Even though extremely poor results have been reported for the treatment of such fractures in the past, much better results can be observed through accurate and meticulous surgical interventions in place today. A study in literature reporting the results of talus fractures after a period of 30 months stated poorer AOFAS results for body fractures with an average score of 58 when compared to neck fractures with an average score of 79 and process fractures with an average score of 85. The same study also noted the worse Maryland foot scores and Hawkins evaluation criteria for body fractures [ 2]. Another reference defined the average score in AOFAS as 68.4. . The high value and successful AOFAS result obtained in the current case after a 2 year follow-up period can be considered to be due to the accurate interpretation of the fracture-dislocation, anatomic reduction with early surgery, and good fixation. However, there is still a need in literature for long-term results pertaining to such uncommon cases. Kuner, E.H., Lindenmaier, H.L., and Munst, P.: Talus fractures. In Tscherne, H., and Schatzker, J. (eds. ), Major Fractures of the Pilon, the Talus, and the Calcaneus: Current Concepts of Treatment. Berlin, Springer-Verlag, 1993: 71-85. This entry was posted in Uncategorized and tagged Subtalar dislocation, Talar body fracture, talonavicular dislocation, Talus. Bookmark the permalink.